In 1958, Frank W. Eichelberger started his career with the Larimer based Bruggeman Heating Company. In 1965, he started his own company, Frank W. Eichelberger Heating and Cooling. 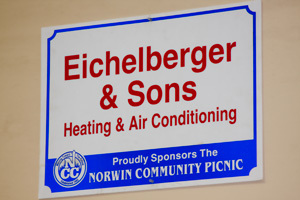 In 1984, he moved his business location to the present location at 10321 Center Highway, North Huntingdon and changed the name to Eichelberger and Sons, Inc. since his sons, Steve and Paul, joined the family business. We offer complete lines of heating and cooling equipment along with indoor air quality solutions. Visit our interactive showroom for a hands on experience.